Bertha Bucholtz returns to her St. Louis home after an unsuccessful stay at the mail-order bridal agency. Her family house is overflowing with her thin, beautiful sisters and their many suitors, and shy, overweight Bertha is lost among the chaos. Even her baking skills - so praised at the agency - aren't special, for her six sisters and her mother are also excellent cooks. Desperate to be living on her own, Bertha searches for a job as a cook but with little success. Then a letter arrives from her nemesis at the bridal agency. Shrewish Prudence Crawford, now Mrs. Michael Morgan, invites Bertha to move to Morgan's Crossing, Montana Territory and work as a cook and housekeeper at the boarding house for her husband's miners. Upon her arrival in Morgan's Crossing, Bertha has to contend with Prudence, who seems to have mellowed - or has she? The boarding house is dirty, run-down, and full of uncouth miners. As the only single woman for miles around and a lauded cook, Bertha quickly becomes the siren of the tiny town as well as nearby Sweetwater Springs, as miners and cowboys flock to court her. Now the shy woman who had no choice of suitors has an abundance of them to pick from. She never would have dreamt having too many swains was a bigger problem than having none at all. The perfect story to end the series! Sweet, loving, and an amazing cook, Bertha had given up on finding love. After the agency closes she takes a great leap of faith in leaving home to travel out to see her old nemesis Prudence and take her up on her offer of a job. When she first arrives she is pretty sure she made a huge mistake but as she literally falls in to the arms of Howie the handyman she realizes that this may be the best decision she ever made after all! 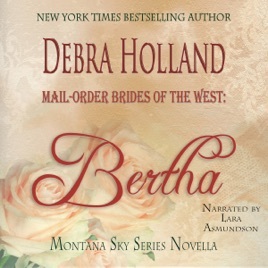 This is my favorite book in the Mail Order Brides of the West series! We get to check back in on all of the amazing women from the agency and their families! I am sad to see their stories end but know that there will be glimpses of them in Debra's other books.